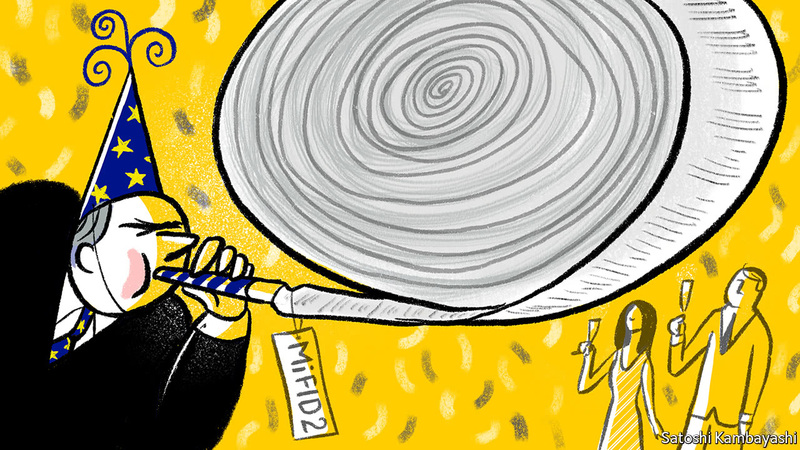 AFTER years of rule-drafting, industry lobbying and plenty of last-minute wrangling, Europe’s massive new financial regulation, MiFID 2, was rolled out on January 3rd. Firms had spent months dreading (in some cases) or eagerly awaiting (in others) the “day of the MiFID” when the law’s new reporting requirements would enter into force. One electronic-trading platform, Tradeweb, even gave its clients a “MiFID clock” to count down to it. Apprehension was understandable. The new EU law, the second iteration of the Markets in Financial Instruments Directive (its full, unwieldy name), affects markets in everything from shares to bonds to derivatives. It seeks to open up opaque markets by forcing brokers and trading venues to report prices publicly, in close to real time for those assets deemed liquid. It also requires them to report to regulators up to 65 separate data points on every trade, with the aim of avoiding market abuse.